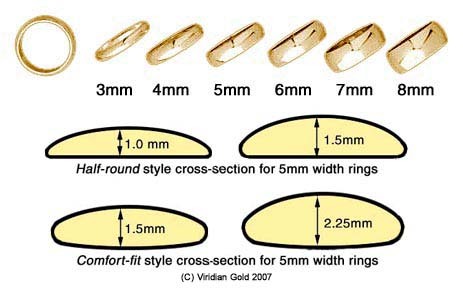 You probably already know that you should make sure that any rings that you are comparing are the same material, ie, both are 14K gold--obviously, there is a difference in cost in 14K and 18K gold rings of the same gram weight! But, you should also make sure that when you are comparing Platinum rings, that your compare the same "fineness" of Platinum. In the US, a jewelry item is allowed to be labeled solely as "Platinum" or "Plat" if it is at least 95% Platinum, that is, it has a fineness of 950. Even so, you will often see an item marked "950 Plat", even though the "950" part is not required by law. Beware of rings that are labeled "900 Plat", because as you might guess, they contain less Platinum than 950, and should be discounted accordingly. Besides the fineness of the gold or platinum, the shape of the ring is vitally important in determining the cost. As the illustration shows (click for a larger view), the half-round style of ring is flat on the inside of the ring, next to the finger, but rounded on the top. The comfort-fit style ring is also slightly rounded on the inside, which makes it easier to slide onto the finger and over the knuckle. But the comfort-fit style is also thicker in the cross-section, which means that it will weigh more than a half-round design. Finally, the quality of the construction of the ring will have a significant impact on price. The more highly polished the finish, the more labor is required to make the ring, and therefore the cost will be affected. In addition, the quality of the surface of the ring is impacted by the quality of the molding of the ring during the manufacturing process. If the surface of the ring is deeply pitted, then no amount of polishing will remove those defects. Your ring should be perfectly smooth inside and outside, with absolutely no evidence of pits, cracks or ripples in the metal surface. You can find several styles and price ranges of men's and women's Gold Wedding Rings and Platinum Wedding Rings on Viridian Gold's website, all available in full and half sizes.